Hello, 2019! Hellooo, Muggles! Long time no see. How have you been up to? I wish you a beautiful and blessed 2019. Too many to write since last year, but you know I’m a lazy writer, hahaha. I want to write about my trip to my hometown, Medan, on Idul Adha last year. But it’s gonna be a long post with loads of photos. So I decide to to write this new year holiday as the opening post in 2019. Actually I wasn’t in mood to go anywhere on holidays, I thought it was better to stay at home. But that day my relative came from Medan, and he wanted to go to Bandung since he had never been to. So my family decided to accompany him, and we had a short family trip. Since we’ve had many trips to Bandung, we didn’t take many pictures that time. It was about 3 hours from Jakarta to Bandung by car. We spent about one hour at Gedung Sate as my relative wished to, and then had lunch nearby. After lunch, we checked in to the hotel. We stayed at Galeri Ciumbuleuit Hotel Bandung, a 4 stars hotel. We chose suites apartement room which contains 3 bedrooms, 2 bathrooms, 1 kitchen, and 1 living room. We stayed for two nights. The ambience was cozy although it was located in busy area. The room rate was affordable, a good choice if you want to have a family getaway in Bandung. I forgot to take pictures of it, I only took one picture of its swimming pool. On the next day afternoon, we went to the Grand Mosque of Bandung (Masjid Raya Bandung). We arrived there at ashar time. There were a lot of visitors on the mosque yard. My nephew and niece were also very happy playing there. It was raining when we left the mosque. When the rain was about to stop, we decided to parked our car and stopped at the shopping outlets. In the evening, we had dinner at Warung ASP (Ayam Saos Pedas) and ordered “Aku Sayap Kamu Special” dish with spicy level 0 & 1. Level 1 was too spicy to me, so I prefered the level 0. The taste was good. Recommended if you look for fine restaurant in Bandung. The next day morning we checked out of the hotel and went to Farmhouse, Lembang. It was fun there. Then we went to La Fresa Strawberry Farm (Wisata Petik Stroberi La Fresa) which was not far away from Farmhouse. Everytime we go to Bandung, picking strawberries is always on our list, hehe. It was raining heavily when we arrived, so we waited for the rain to stop before picking strawberries. There were some food courts for the visitors who wanted to buy meals or snacks. The entrance fee to La Fresa Farm is IDR 10k/person free a plastic cup of strawberry juice. And the price for strawberries is IDR 20k/100gr. After having fun at La Fresa Farm, we decided to go back to Jakarta. On the way home, we stopped at a rest area to have lunch and buy some cakes and snacks for friends. Well, this was my post about new year holiday. What about yours? Share with me. Hello! Long time no see, muggles! After Indonesia Fashion Week 2018 and Muslim Fashion Festival 2018 in March-April, now it’s time for Jakarta Fashion Fashion Week 2019! Jakarta Fashion Week 2019 (JFW2019) is held at Senayan City on 20-26 October 2018. Yesss, you still can go there until Friday! I attended JFW2019 on day 1, last Saturday. I arrived there in the afternoon and watched the fashion show: Australian Fashion Showcase featuring Batik Chic by Novita Yunus & The Darwin Aboriginal Art Fair Foundation. The display was mesmerizing, the ethnic collections with modern touch. Loved the cutting and detail, it was festive yet still looked simple and elegant. I could say those collections in three words; unique, aesthetic, and wearable. As always, JFW were visited by fashion enthusiasts. You can also meet the popular fashion people there. The enthusiasm to this event are always the same every year, even bigger. It shows that Indonesian people nowadays are aware of fashion even more. A lot of people are eager to see the collections of talented designers and satisfy their interests in fashion by watching the talkshows or shopping at the fashion booths there. JFW is one of the biggest fashion events in Indonesia. Through these fashion events, the works of Indonesian fashion designers and the development of Indonesian fashion industry are introduced to the world. So, keep up the good works! There are some spots of JFW2019 at Senayan City; Fashion Tent (built at the outdoor area), Fashion Atrium, and Fashionlink Showroom & Market (The Hall, 8th Floor). There are still fashion shows, talkshows, and some other events coming up. You can check their website or social media accounts for schedules and more info. Don’t forget to visit JFW2019, fashion people! Long time no see. What have you been up to, guys? I really miss blogwalking since I’ve rarely been on my blog these days. Actually, too many to write but I’m still waiting for my mood to write them, haha. Jadi kali ini saya mau berbagi cerita tentang event yang saya kunjungi pada hari Minggu, 1 April kemarin aja ya. It was Indonesia Fashion Week 2018. Indonesia Fashion Week 2018 (IDFW2018) yang diselenggarkan pada tanggal 28 Maret – 1 April di Jakarta Convention Centre (JCC) ini mengangkat tema “Cultural Identity”. Saya datang pada hari terakhir IDFW2018, dan saya menyaksikan dua fashion show yaitu “Exotic Cultural” dan “Unicultura”. Ini pertama kalinya saya mengunjungi IDFW, tahun-tahun kemarin entah kenapa saya belum merasa tertarik. Saya sempat urung pergi, since I woke up late and realized that the fashion show would be started at 10am. But I had got two invitation tickets in hand, so I decided to go. And when I arrived there, the fashion show hadn’t started yet, apparently it was postponed for about 1 hour. Sesuai tema yang diusung ” Cultural Identity”, koleksi yang ditampilkan bernuansa etnik, namun tetap dengan sentuhan modern. Menurut saya, tema Cultural Identity yang diangkat sangat baik untuk memperkenalkan kreasi lokal serta memacu semangat dan kreativitas para designer dan industri fashion Indonesia dalam menghasilkan karya yang dinamis namun tetap berpegang pada budaya. Seperti yang kita tahu, industri fashion Indonesia sangat berkembang termasuk juga di dalamnya modest fashion. Modest fashion memegang peranan penting dalam perkembangan fashion Indonesia. Para modest fashion-designer Indonesia seperti Dian Pelangi dan Ria Miranda kini juga sudah mulai merambah dunia fashion internasional. Dan perhelatan tahunan IDFW menjadi ajang bagi para designers Indonesia untuk menunjukkan kreasi mereka. Well, menurut saya secara keseluruhan koleksi yang ditampilkan dalam fashion show yang saya tonton kemarin terlihat elegant, sophisticated, stylish, and wearable. IDFW sepertinya sangat diminati para pecinta fashion di Indonesia, terbukti dengan fashion show yang dipenuhi audience hingga ke tribun atas Plenary Hall. Btw, sorry for not showing you some decent photos, I only recorded some videos using my smartphone when I was there, and the pictures I post here are the screenshots of those videos. Selain fashion show, IDFW juga mengadakan acara lain seperti talkshow, beauty conference, dan model competition. Di sana juga terdapat banyak booth yang menjual koleksi dari berbagai brand lokal ternama Indonesia ataupun brand-brand baru. Banyak juga booth yang menjual koleksi etnik seperti batik dan kain jumputan, craft, hingga aksesoris. Karena tujuan utama saya mengunjungi IDFW2018 adalah untuk menyaksikan fashion show, saya tidak terlalu banyak mengitari booth yang ada di sana. Saya mengambil beberapa foto di sana sambil berjalan. Saya hanya berkeliling sebentar, belanja sedikit, dan seperti kebanyakan pengunjung lainnya, berfoto di beberapa spot, hahaha..
Segitu aja cerita saya tentang kunjungan ke IDFW2018. My hope is Indonesia Fashion Week as the annual fashion event can consistently support Indonesian designers and fashion industry to show off their ideas and creativity, and be the medium for fashion enthusiasts to satisfy their interest and learn more about fashion. The title, lol, it’s way too late hahaha. But hey, it’s still January! So… Hello, Muggles! After a very long hiatus, finally I come back. My last post was in January 2017, oh my dusty blog! So where was that girl who said she wanted to post more often in 2017? Hahaha, my bad. Fine, I will not say “I want to blog regularly in 2018”. I have no particular reason why I left my blog for such a long time. Just not in mood maybe haha. Not much to tell about 2017. Just a little busy with works and online shop thingies, and also my sister was hospitalized. But alhamdulillah, she’s getting better now, and I hope she will recover soon, aamiin. Overall, 2017 was fine. I have no special resolutions in 2018. I have plans, of course, but I want to keep it for myself. So yeah 2018, I’m ready for the challenges. Actually I have many things to write on my blog, and also the post list I made in 2017. I hope I post them soon on my blog. What about you, friends? What have you been up to? Share with me. Postingan pertama di tahun 2017. Apa sih yang ada dalam pikiran kamu kalau mendengar kata “Bogor”? Kota Hujan, udara sejuk, atau liburan? Sepertinya kita memang teringat akan tiga hal itu ya kalau membicarakan tentang Bogor. Dan memang sepertinya Bogor, khususnya Puncak, selalu menjadi salah satu destinasi wisata favorit saat liburan ataupun weekend. Terlebih untuk warga Jakarta, dengan jarak yang tidak terlalu jauh, Bogor sering dijadikan short vacation untuk sejenak menikmati udara sejuk dan menghindari kesibukan Jakarta. Nah selain wisata dan udara sejuk, ada lagi nih yang merupakan khas kota Bogor, yaitu Bika Bogor Talubi, Si Lembut yang Menggoda, oleh-oleh khas Bogor! Sesuai namanya- Talubi- bika Bogor ini terbuat dari Talas dan Ubi. Sudah tahu kan kalau Bogor itu juga terkenal dengan talasnya? Nah, Bika Bogor Talubi ini ingin mengangkat cita rasa lokal dengan tampilan yang apik. Sebagai orang yang lahir dan besar di Medan, kota yang terkenal dengan Bika Ambon sebagai makanan khas-nya, tentu saja saya sangat penasaran dengan Bika Bogor. Dan saat kami ke Puncak Maret 2016 lalu, kami singgah ke salah satu outlet mereka. Nah, yang jalan-jalan ke Puncak pas liburan akhir tahun kemarin sudah mencicipi Bika Bogor, belum? Atau ada yang belum tahu tentang Bika Bogor, boleh deh diterusin bacanya. Berbicara tentang makanan, maka bisa dibilang rasa adalah hal utama yang dinilai. 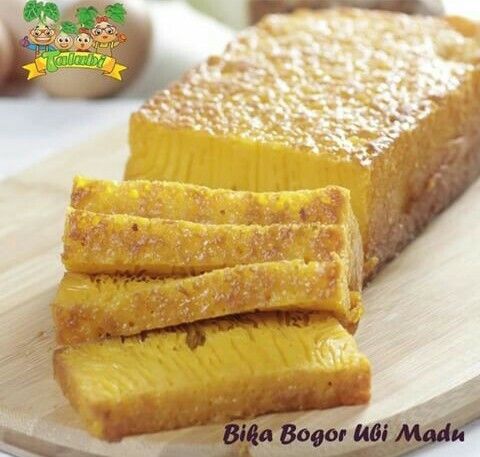 Bika Bogor Talubi ini memiliki cita rasa manis yang pas dan kelembutan yang menggoda. Iya, manisnya itu pas, tidak terlalu manis sampai membuat eneg kalau dimakan. Dan yang paling memikat adalah kelembutannya. Terasa lembut banget di lidah ataupun saat digigit, tapi juga nggak lengket. Beneran bikin nggak pengen berhenti makannya, deh. Selain rasa, estetika penampilan juga sangat berpengaruh ya untuk penilaian menarik atau tidaknya makanan. Nah, Bika Bogor Talubi memiliki penampilan yang simple dengan dua pilihan bentuk yaitu memanjang (balok) ataupun yang mini seperti mangkuk-mangkuk kecil. 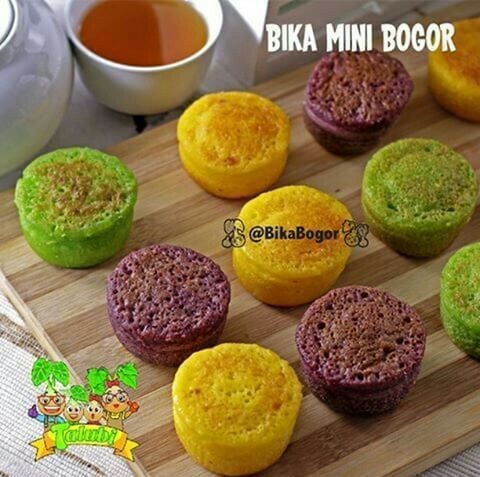 Namun bentuknya yang simple dengan warna-warna natural ini yang membuat Bika Bogor Talubi terlihat sangat menggugah selera. Coba deh kamu lihat foto-fotonya di instagram, pasti bikin kamu ingin langsung mencicipi. 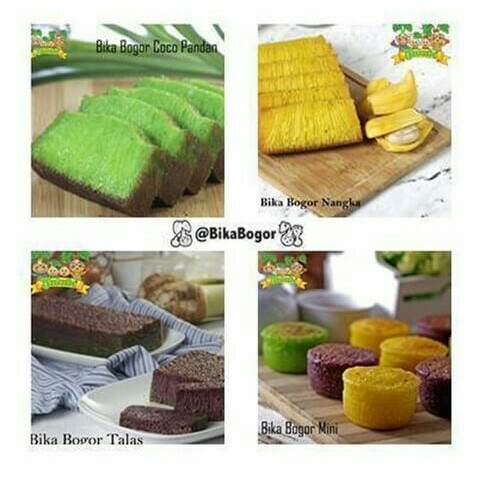 Bika Bogor Talubi memiliki varian rasa: Bika Bogor Talas, Bika Bogor Coco Pandan, Bika Bogor Nangka, dan Bika Bogor Ubi Madu. 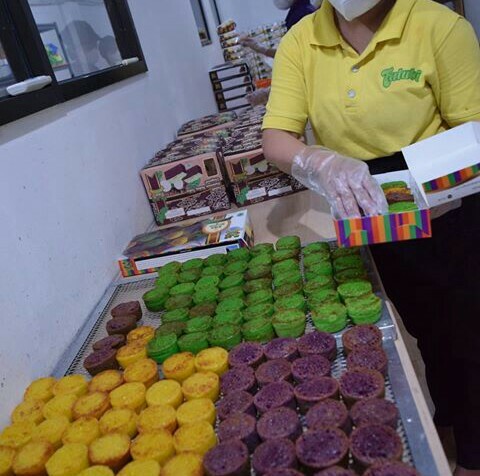 Dan ada tersedia juga Mini Bika yang dalam satu kotak isinya 10 pcs terdiri dari dari tiga varian (Talas, Coco Pandan, Nangka). 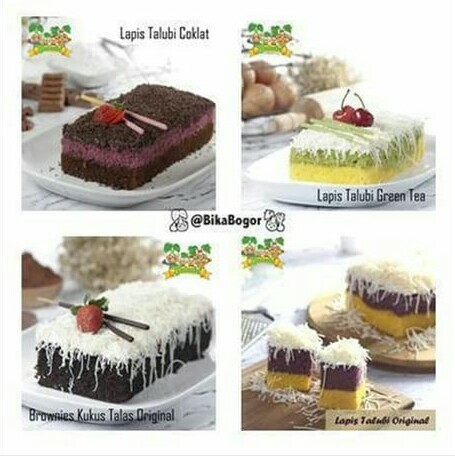 Selain Bika, di Bika Bogor juga ada Lapis Talubi Original, Lapis Talubi Coklat, Lapis Talubi Green Tea, dan Brownies Kukus Talas Original yang rasanya juga tidak kalah enak dengan bikanya. 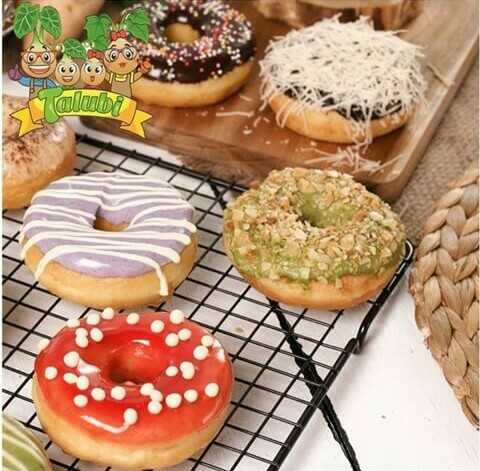 Dan di Bika Bogor juga ada donat, loh! Lengkap banget kan varian-nya. Dan berbagai varian ini bisa kamu dapatkan dengan harga terjangkau. Rasa enak dan harga terjangkau. Kualitasnya? Bika Bogor Talubi menggunakan bahan-bahan yang alami dan berkualitas. 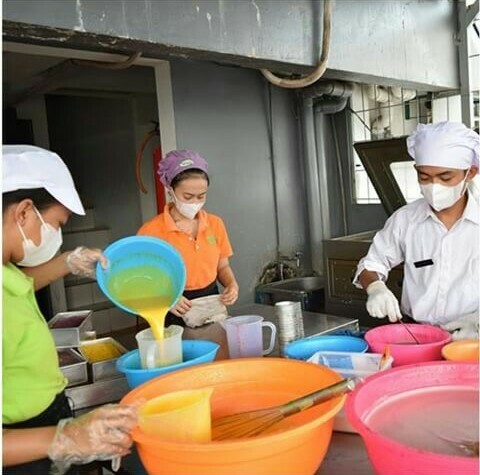 Talas asli Bogor untuk bahan baku Bika Talas, ubi untuk Bika Ubi Madu, dan untuk Bika Coco Pandan dan Bika Nangka menggunakan bahan kombinasi. Dan yang paling penting, Bika Bogor Talubi tidak menggunakan bahan pengawet, makanya hanya bertahan selama 4 hari. Camilan yang sehat, kan! Proses pembuatannya juga higienis. Berikut foto-foto proses pembuatan Bika Bogor Talubi. 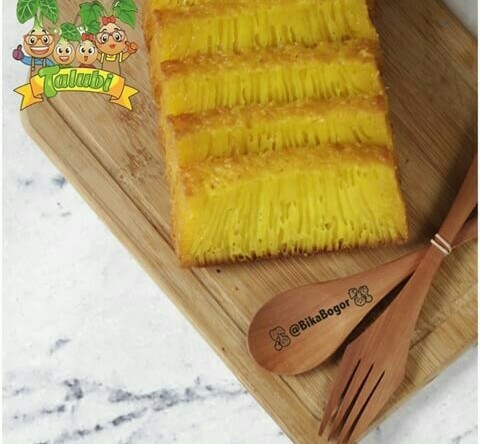 Bika Bogor Talubi saat ini memiliki 3 outlet di Bogor. 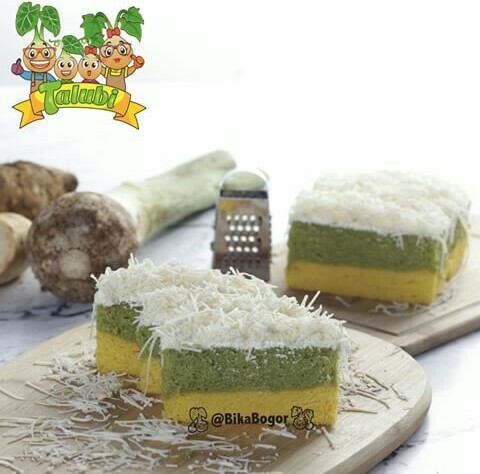 Kalau kamu tidak berdomisili di Bogor dan tidak sedang berpergian ke sana tapi pengen makan Bika Bogor Talubi? Bika Bogor juga melayani pemesanan online. Jl. Soleh Iskandar No 18 B Bogor. Sebagai camilan yang enak dan sehat, Bika Bogor Talubi tentu bisa menjadi pilihan untuk oleh-oleh ataupun dimakan bersama keluarga dan teman-teman. Dan yang punya resolusi hidup sehat di tahun 2017, Bika Bogor Talubi yang tanpa bahan pengawet ini cocok banget dijadikan salah satu pilihan camilan. Liburan akhir tahun memang sudah berakhir, tapi kita masih punya banyak akhir pekan untuk berkumpul bersama keluarga ataupun teman-teman. Selamat menyambut akhir pekan! Goodbye and Thank You, 2016! Last day in 2016! Time flies. It feels like yesterday when 2016 began. Yes, 2016 has gone so fast to me. It was just a fine year. Some good things, some bad things. Some laughters, Some tears. One thing for sure, 2016 has taught me many things, given me so much lessons. So, I want to say alhamdulillah, thank you Allah for your blessings. I’m not the type of person who always makes resolutions. My only hope is I can be the better person, the better version of me in every way. Not only think about dreams, but also find a way to achieve them. Not only think about myself, but also think to share. Despite not having any certain resolution, I still make a list of my plans or what things I want to do in 2017, including about blogging. Hopefully it can motivate me to do more. 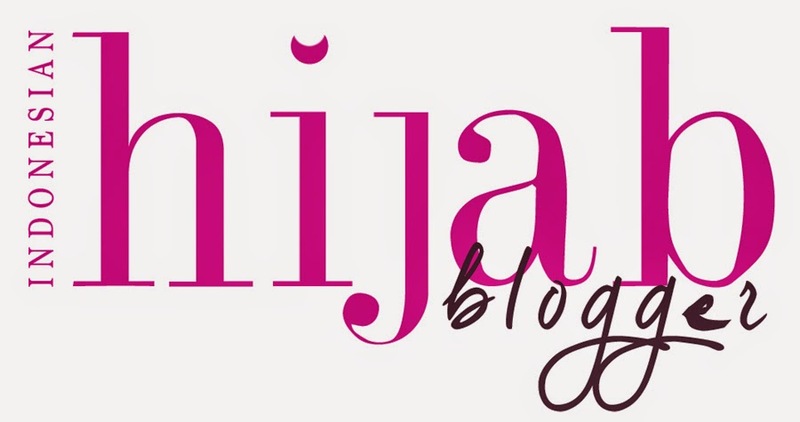 Talking about blogging, I am actually still confused of what the niche of my blog is. It seems I talk about everything here. I write what I want, lol. I know I know I should’ve decided what my blog should be, not just write. But, I don’t want to think too hard about it. I want to be consistent in posting first. And so grateful I managed to post regularly in the past few months. Although I rarely posted in the early 2016, I finally managed to post once a week since September. Hey, that’s already a progress, isn’t it?! So, in 2017, I want to be more consistent. Nope, I’m not saying I will post like everyday. Probably still once a week, or twice a week maybe? I don’t know, let’s see. But I hope I post my writings at least once a week. I actually have written some topics that I want to share here, but still in the waiting list. So I hope I can post them in 2017. Btw, I also want tidy up my blog appearance, such as theme, categories, menu, etc. But the most important is I want to write the better contents. Well, the lovely (hopefully) 2017 is coming. I don’t only wish for happiness, but also how to be stronger in facing any obstacles, and can rise after every sadness. 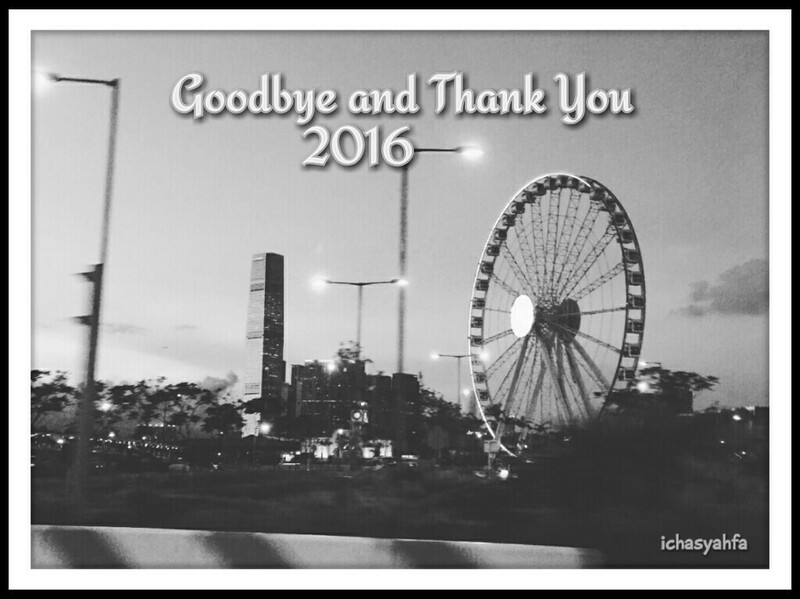 Good bye 2016, thank you so much for the memories and lessons. And welcome 2017, let’s be friends! Sorry for rambling, hahaha. I hope you all have a quality time whatever you do at this moment, spending time with your family, friends, or even still at work. Enjoy your last minutes in 2016. Let’s start this year with basmalah, may Allah always bless us, aamiin. And what’s your hope in 2017? Special wish, HAPPY BIRTHDAY SIR ALEX FERGUSON! He turns 75 today, wow! Aku masih berumur empat tahun saat ayah pergi untuk selamanya, meninggalkan aku dan bunda. Saat itu aku menangis, tapi aku menangis karena kukira ayah sakit, dan aku merasa marah karena ayah hanya diam saja saat kuajak bicara, tidak menanggapi saat kuajak bermain. Lalu kulihat banyak orang berdatangan, keluargaku, tetangga-tetanggaku, dan entah siapa lagi. Aku melihat bunda menangis, begitupun semua orang yang datang. Ayah dibaringkan di tengah ruangan, dan orang-orang membaca surat Yasin. Bunda kemudian mengatakan padaku bahwa ayah telah meninggal. “Ayah sudah meninggal, Nak. Ayah sudah dipanggil oleh Allah.” ucap bunda terisak sambil membelai rambutku. Aku hanya diam saja. Aku belum sepenuhnya mengerti. Aku tahu bahwa seseorang yang meninggal itu adalah orang yang sudah pergi meninggalkan hidup kita. Tetapi aku belum paham benar bentuk kepergian itu. Ketika jasad ayah dimasukkan ke liang lahat dan orang-orang menimbunnya dengan tanah, aku menangis sejadi-jadinya. Dan saat itu kulihat bunda tak sadarkan diri. Sepeninggal ayah, bunda jatuh sakit. Tetapi kemudian bunda berusaha tegar demi aku. Ia mencoba menjalani hidupnya kembali walaupun terasa berat. “Bunda, apa kita bisa bertemu dengan ayah lagi?” Tanyaku suatu hari. “Insya Allah, Nak, jika Allah mengizinkan. Makanya Khanza rajin shalat, mengaji dan belajar ya, Nak. 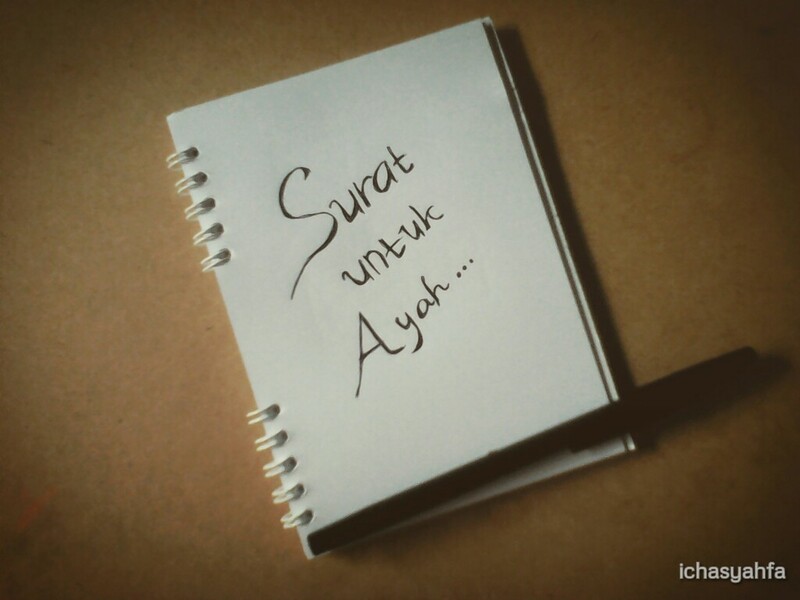 Berdoa buat ayah. Insya Allah, nanti kita dipertemukan dengan ayah lagi di surga.” Bunda dengan sabar menjelaskan padaku. Tetapi hari-hari berikutnya aku semakin merindukan ayah. Hari demi hari bunda dengan sabar membujukku, menyemangatiku untuk terus rajin shalat, mengaji, dan belajar. Saat itu aku sudah akan memasuki Sekolah Dasar, aku sudah lancar membaca dan menulis. Aku menangis sesenggukan saat ulang tahunku yang kelima. Biasanya, ayah selalu menyiapkan kue ulang tahun kesukaanku, membelikan boneka cantik dan menyanyi untukku. Tapi di hari itu, ayah tidak ada. 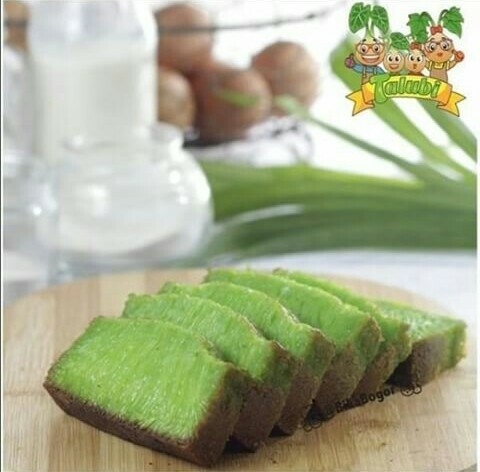 Kue ulang tahun sudah disiapkan bunda. Pun dengan pesta bertemakan Snow White yang semarak yang dihadiri oleh sanak saudara dan teman-temanku yang membawa banyak kado. Tapi, aku tetap tidak bisa tersenyum, karena aku sangat merindukan ayah. Bunda, yang seperti malaikat, selalu membujukku dengan sabar, tak pernah marah padaku. Setelah semua tamu pulang, aku memeluk bunda. “Bunda, Khanza sudah shalat, mengaji, dan belajar. Tapi Khanza sangat rindu ayah. Khanza ingin bertemu ayah.” Aku menangis. Bunda menghapus air mataku dan menatapku tersenyum. “Ini kan ulang tahun Khanza, Khanza tulis surat buat ayah ya.” Ucap bunda. “Iya. Tulis semua yang ingin Khanza bilang ke ayah. Khanza tulis kalau Khanza merindukan ayah, ingin bermain bersama ayah lagi, dan berjanjilah pada ayah bahwa Khanza akan selalu jadi anak yang baik, bahwa Khanza akan mencapai semua cita-cita Khanza. Khanza tulis suratnya di setiap ulang tahun Khanza.” Jelas Bunda sambil membelai rambutku. Aku melihat matanya berkaca-kaca. “Tapi ingat ya, janji-janji yang Khanza tulis di surat harus Khanza tepati.” Bunda menjawil hidungku, dan tersenyum. Mataku berbinar, lalu memeluk bunda. Aku sangat menyayanginya. Malamnya aku menulis surat. Aku menyobek selembar kertas dari salah satu buku tulisku yang berwarna-warni bergambar Snow White, karakter kartun kesukaanku. Aku menulis semua kerinduanku pada ayah. Bercerita tentang bunda hingga tentang teman-temanku di sekolah. Dan tak lupa, seperti yang bunda katakan, aku menulis janji-janjiku untuk setahun ke depan. Aku berjanji aku akan selalu rajin shalat dan mengaji. Akan selalu tekun belajar agar nilaiku selalu baik. Dan aku akan menuruti nasehat bunda, dan tidak melawan perkataanya. Aku kemudian memasukkan suratku ke dalam amplop kecil yang dibelikan bunda. Dan aku memasukkan surat itu ke dalam sebuah kotak bekas tempat perhiasan bunda yang bunda berikan padaku, lalu kusimpan ke dalam laci meja belajarku. Malamnya aku tidur dengan nyenyak, dan aku bermimpi bertemu dengan ayah. Ayah, bunda, dan aku bermain bersama di taman bunga yang sangat indah. Sejak saat itu, setiap tahun tepat di hari ulang tahunku, aku selalu menulis surat untuk ayah. Tentang kerinduanku, bercerita tentang pengalaman-pengalamanku, hari-hari yang kulewati bersama bunda ataupun teman-temanku. Juga tentang janji-janji dan rencana-rencanaku di tahun lalu, yang mana yang yang berjalan baik, yang mana yang masih harus kuperbaiki. Dan tidak lupa, seperti biasa, aku menuliskan janji-janji dan rencana-rencanaku untuk tahun berikutnya. Ya. Aku tahu bahwa surat itu tidak akan mungkin dibaca ayah. Tapi satu hal yang pasti, aku dapat mengobati kerinduanku kepada ayah dengan menulis surat-surat itu. Dan saat ini aku sudah akan duduk di kelas 6, aku tidak merasa perlu menulis surat-surat itu lagi. Aku pikir aku sudah cukup besar untuk mengerti bahwa tentang surat itu hanya cara bunda agar aku tidak merasa sedih akan kepergian ayah saat aku masih kecil. Tapi sekarang aku sudah besar. Aku masih sedih jika mengingat kepergian ayah, dan akan selalu merindukannya, tetapi aku sudah tahu bagaimana caraku untuk mengatasi kesedihanku tanpa surat-surat itu. “Bunda, Khanza tidak akan menulis surat untuk ayah lagi.” Ujarku saat aku dan bunda duduk menghadap meja makan, ingin menyantap makan siang. Aku melihat kalender. Besok adalah hari ulang tahunku yang ke sepuluh. Bunda menghela napas, lalu tersenyum. “Iya, Sayang. Saat itu Bunda memang menyuruh Khanza menulis surat agar Khanza tidak sedih.” Ujar bunda. Aku hanya diam saja mendengarkan. “Tapi lebih dari itu, Bunda ingin kamu menulis janji-janji kamu di surat itu agar kamu selalu termotivasi untuk selalu berbuat baik dan menjadi seperti apa yang kamu janjikan di surat itu. Nah, karena kamu berjanji akan selalu menjaga shalat, rajin mengaji dan belajar serta selalu berbuat baik, tentu kamu akan menepatinya kan, Nak? Doa kamu insyaallah akan sampai kepada ayah karena doa anak yang saleh/saleha akan sampai kepada orang tuanya yang meninggal, begitu janji Allah, Nak.” Bunda tersenyum lagi. Aku tertegun, mencerna kata-kata bunda. “Darimana Bunda tahu? Bunda baca surat-surat Khanza?” selama bertahun-tahun setelah kepergian ayah aku benar-benar tidak pernah menanyakan apakah bunda pernah membaca suratku atau tidak. Aku selalu menyimpan kotak yang berisi surat-suratku itu dengan baik walaupun meja belajarku telah diganti dengan yang baru. “Iya, Sayang. Setiap tahun, bunda selalu membaca surat-surat yang kamu tulis, setelah kamu tidur. Maaf ya Nak, Bunda tidak bilang. Soalnya Bunda takut kamu malu, kamu kan banyak memuji Bunda di surat kamu.” Bunda tertawa, “Terus, kamu juga lebih banyak bercerita tentang si cowok pintar di sekolah kamu yang kamu kagumi itu di surat untuk ayah daripada sama Bunda, kan?” Bunda menggodaku. “Ih, Bunda…” Aku kemudian memeluk bunda manja. Aku merasa bersalah tadi sempat berbicara agak keras pada bunda. “Maaf ya Bunda, tadi Khanza marah sama Bunda,” ujarku. Ucapan bunda membuatku terharu dan tanpa sadar menitikkan air mata. Aku kemudian mencium kening dan pipi Bunda. Terima kasih ya Allah, telah memberikan aku seorang ibu yang hebat seperti dia. Aku melirik jam dinding. Pukul 00.01 WIB. Selamat Ulang Tahun, Khanza Sayyidina! Aku mengambil selembar kertas binder, masih dengan karakter kesukaanku, Snow White. Aku menulis surat. Setelah selesai, aku melipatnya, memasukkannya ke dalam amplop, lalu kuletakkan ke dalam kotak bersama surat-surat lain di laci meja belajarku. Lalu aku beranjak tidur. Assalamualaikum, Ayah. Ayah, hari ini Khanza berulang tahun yang ke-10. Khanza sudah besar kan, Ayah? Ini surat Khanza yang ke-5 setelah kepergian ayah. Khanza tidak tahu setelah ini, apakah Khanza akan menulis surat lagi atau tidak. Tapi Ayah, insya Allah, Khanza tidak akan pernah lupa pada janji-janji Khanza untuk selalu menjadi anak yang baik dan selalu menyayangi bunda. Khanza janji, Khanza akan selalu bersemangat dalam menjalani hari-hari Khanza agar suatu saat Khanza bisa menggapai semua cita-cita Khanza. Tidur yang tenang, Ayah. Khanza dan Bunda akan selalu menyayangi Ayah, dan Ayah akan selalu ada di hati kami. Dedicated to my father who passed away four years ago. Rest in peace, Dad. May Allah grant you a place in jannah, aamiin. Miss you a lot, Dad. We love you, and you’ll always be alive in our heart. And Happy Mother’s Day to my mom. Thank you for always being there for me, your childish and stubborn girl. May Allah always bless you, aamiin. I love you more than the words I can describe. Selamat Hari Ibu, Bunda! But this time is different! I’m not going to talk about Manchester United or Premier League whatsoever, but it’s time for Indonesian National Team (Timnas)! As we know, after a long and not easy journey, Indonesia goes to AFF 2016 final and will play against Thailand in the first leg of final tonight at Pakansari Stadium, Bogor, Indonesia. Yeah, we made it! I am so excited yet nervous at the same time! I don’t want to be over excited, but I seriously can’t describe my feeling. And I know all of you are excited too. Whether you watch at the stadium or at home, whether you are football fans or not, I know we all support our team. Because Timnas play for Indonesia. So, I was a bit upset when I saw that some people were unnecessarily complaining about the stadium. You know that GBK is still under renovation and after many considerations, Pakansari Stadium was chosen. And worse, some people also say that they won’t support Indonesia- their own team- because they are sure that Indonesian team will also fail this time and will never win. You underestimate your own team, mate. Pathetic. Yes, true that Indonesia have never won AFF Cup. Yes, true that it’s gonna be a very tough game against Thailand. But, do those things make you underestimate your own team? Do those things make you doubt your team and refuse to support them? Sigh. Well, let’s stop talking about unnecessary things, stop complaining, just get behind our team. It is not just about football, it is about the pride of Indonesia, because the team will be playing in the name of Indonesia. Let’s unite, Indonesian! And for Timnas, don’t think too much about our excitement, just do your best! Win or lose, we will always support you. Belanja di Bukalapak itu mudah dan praktis banget. Dan sering ada diskon loh dari pelapaknya! Untuk kamu yang sudah sering belanja di Bukalapak pasti sudah akrab dengan cara belanjanya. Tapi mungkin ada yang baru mau berbelanja online, kamu bisa ikuti langkah-langkahnya. Begini cara belanja di Bukalapak dengan aplikasi Bukalapak. Pilih produk yang ingin kamu beli, bisa lihat di kategori atau langsung ketik keyword di kolom “cari barang”. Bukalapak akan menampilkan hasil pencarian kamu. Kamu bisa memilih produk yang paling sesuai kriteria kamu. Kamu juga bisa melihat reputasi pelapak dari feedback dan ulasan yang diberikan oleh pelanggan mereka, bisa jadi bahan pertimbangan kamu kan. Dan kamu juga bisa langsung tanya-tanya ke pelapaknya melalui menu “pesan”. Setelah kamu menentukan produk mana yang ingin kamu beli, maka kamu tinggal melakukan pembelian. Klik tombol “beli”, kemudian lanjutkan ke pembayaran. Review lagi data-datamu seperti nama, alamat, nomor telepon. Pastikan data yang kamu isi sudah lengkap dan jangan lupa memilih layanan pengiriman, lalu kamu bisa melanjutkan pembayaran. Kamu akan diberikan rincian dan total biaya yang harus kamu bayar. Kamu bisa memilih beberapa cara pembayaran yang ditawarkan oleh Bukalapak.Kamu bisa melakukan pembayaran melalui Bukadompet, Transfer Bank, Mandiri Clickpay, Mandiri E-Cash, CIMB Clicks/Rek. Ponsel, BCA Klikpay, Kartu Visa/Mastercard, atau Indomaret dan Alfamart. Kalau kamu pilih transfer maka akan ditampilkan beberapa rekening bank tujuan yang bisa kamu pilih, trus mentransfer nominal pembayaran yang unik hingga digit terakhir untuk memudahkan verifikasi. Setelah transfer lakukan konfirmasi pembayaran. Kalau kamu memilih pembayaran melalui Indomaret, lakukan langkah yang awal yang sama, kemudian pilih metode pembayaran dengan indomaret. Kamu tinggal datang ke gerai Indomaret dan memberitahu kode tagihan kamu pada kasirnya. Setelah membayar kamu tidak perlu melakukan konfirmasi pembayaran karena pembayaran kamu sudah otomatis terekam oleh sistem Bukalapak. Setelah pembayaran kamu terverifikasi, status pembayaran dari “menunggu konfirmasi pembayaran” menjadi “dibayar” dan kamu tinggal menunggu barang pesanan kamu sampai. Kamu bisa melihat sampai di mana proses transaksi kamu di halaman Detail Transaksi. Dan kamu bisa juga menanyakannya pada pelapak dengan menu pesan. Dan kalau kamu sudah menerima barang pesananmu, kamu silakan lakukan konfirmasi penerimaan barang dengan memilih “konfirmasi terima barang” pada halaman Detail Transaksi. Dan jangan lupa beri feedback untuk pelapak ya. Kamu juga akan mendapatkan pemberitahuan via email untuk setiap transaksi kamu. Nah, gampang dan praktis kan belanja di Bukalapak. 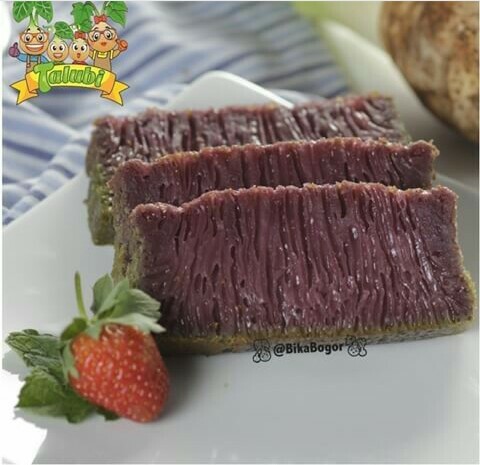 Sejauh ini saya belum pernah kecewa belanja di Bukalapak, dan saya senang banget karena pesanan kain flanel saya kemarin cepat banget sampainya. Kalau sampai batas waktu yang ditentukan barang pesanan kamu belum sampai, uang kamu akan dikembalikan dengan fitur BukaDompet atau ke rekening kamu. Bukalapak menjamin keamanan transaksi kamu, dan kamu juga bisa membaca tips-tips dari Bukalapak untuk menghindari penipuan. Jadi, jangan ragu untuk belanja di Bukalapak. Bukalapak menjadi salah satu platform e-commerce yang cukup populer saat ini. Dan e-commerce lain yang sangat menginspirasi saya adalah Hijup. Hijup merupakan e-commerce fashion muslimah yang sudah berkiprah di dunia internasional. Di Hijup kamu bisa menemukan berbagai macam busana muslimah dari berbagai macam brand dan juga karya dari para designer terkenal. Selain busana, kamu juga bisa menemukan sepatu, dan aksesoris yang bisa menambah cantik penampilan kamu. Saya pernah menulis tentang Inspirasi Wanita Volume 1: Pintar Berbisnis, Bijak Mengelola Keuangan, dan Minggu 27 November kemarin saya juga menghadiri Inspirasi Wanita Volume 3: Berawal dari Hobi, Kreatif Jadi Produktif. Menyenangkan sekali bisa mendengar cerita dari para narasumber yang inspiring. 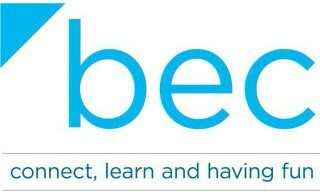 Saya bisa belajar tentang semangat mereka, keinginan mereka untuk berbagi sekaligus menikmati apa yang mereka kerjakan, serta berpikir untuk konsisten dan selalu menemukan ide-ide baru. Well, demikian postingan saya kali ini, mulai dari cerita tentang hobi saya, pengalaman berbelanja di Bukalapak, sampai talkshow inspiratif dari Hijup dan Bukalapak. Jadi, menurut saya jika kita mempunyai hobi, apapun itu selama positif dan bisa membuat kita senang menjalankannya, lakukan saja. Hobi dapat membuat kita menjadi lebih kreatif dan menjadi sarana untuk belajar menjadi orang yang bermanfaat. Paling tidak, bisa bermanfaat bagi diri kita sendiri dengan menjadi lebih produktif. Alhamdulillah kalau ternyata bisa menghasilkan dan bermanfaat bagi orang lain. Karena manfaat kepada orang lain akan kembali untuk kebaikan diri kita sendiri. Terima kasih sudah membaca! Setelah seharian di Ancol, pulangnya kami singgah di kawasan Kalimati, Pademangan, untuk makan seafood. Kakak saya mengajak makan di Seafood 94 Mulyono, kata kakak saya kakak ipar pengen makan di situ karena dulu sering makan di situ sewaktu masih kuliah. Kami sampai sekitar jam 5 sore, terlihat di kawasan itu banyak seafood kaki lima. Mengingatkan saya pada kawasan Ring Road, Medan, yang juga menjadi salah satu pusat kuliner malam street food. Saat kami sampai, Seafood 94 Mulyono terlihat masih sepi karena memang baru buka, baru ada dua orang pengunjung selain kami. Kami langsung memesan. Karena hari itu kami makan siangnya juga agak sorean, jadi sore itu kami masih terlalu kenyang untuk makan nasi, kami memesan menu seafood-nya saja. Kami memesan 3 porsi Kerang Ijo Saus Padang, 1 porsi Kepiting Saus Asem Manis, 3 porsi Udang Saus Padang, 2 porsi Cumi Goreng Tepung, dan 2 porsi Cah Kangkung. Rasanya lumayan. Bumbunya meresap. Saya suka banget kerangnya. Cuminya crispy, udangnya juga enak. Tapi saya kurang suka kepitingnya, menurut saya kurang segar. Apa mungkin lidah saya aja haha. Secara keseluruhan, untuk ukuran street food rasa sajian mereka tidak mengecewakan. Penyajian yang cepat juga menjadi nilai plus. Ada plus, ada minus. Minusnya menurut saya penyajiannya kurang memperhatikan estetika (sausnya meleber-leber, bahasa apa ini? 😂 ). Terus tempatnya. Kalau di tendanya sih cukup bersih, tapi lingkungan di sekitarnya membuat kurang nyaman. Pemandangan di sampingnya itu a bit messy jadi ya gitu deh tapi cukup luas jadi enak untuk parkir. Trus di sekitarnya di dekat jalan itu banyak genangan air, tapi namanya musim hujan ya. Untuk street food, hal-hal seperti itu mungkin bisa dimaklumi. Saat kami makan, pengunjung lain mulai berdatangan. Dan saat kami hampir selesai makan, pengunjung semakin banyak berdatangan, bahkan hampir memenuhi semua kursi. Sepertinya Seafood 94 Mulyono ini sudah memiliki banyak pelanggan tetap. Dan memang setelah saya baca reviewnya, banyak yang merekomendasikan Seafood 94 Mulyono sebagai pilihan kuliner malam untuk menu seafood.